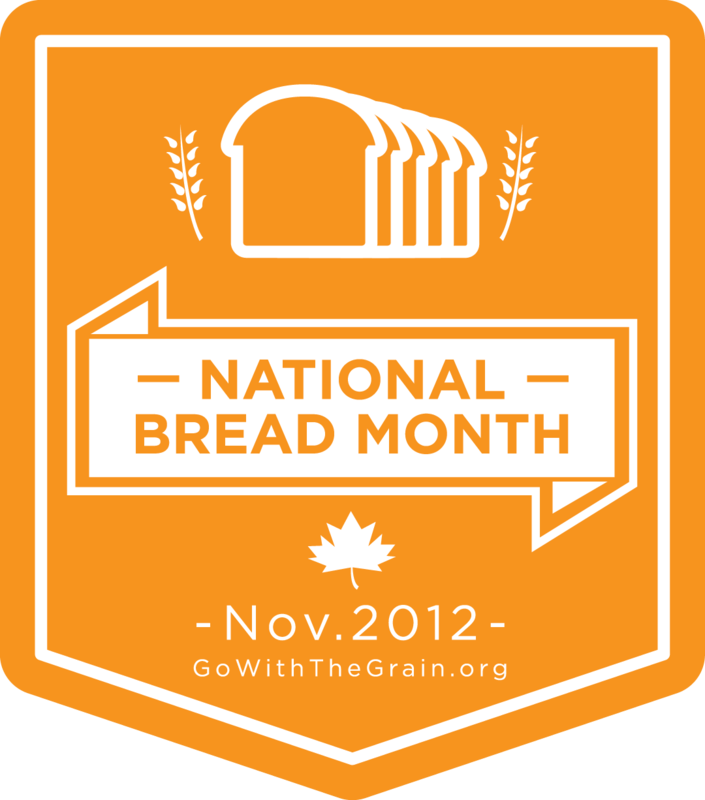 Did you know that November is National Bread Month? When I found out, I knew we had to have one of my families favorite sandwiches! Grilled cheese! This is a mini grilled cheese sandwich recipe, to be exact! I depend on sandwiches all the time. As a busy mom who works outside of the home part-time, I depend on them for myself for easy lunches. I also count on them at times for an easy dinner or an easy lunch for W. He’s a peanut butter and jelly fan in addition to grilled cheese. And I love that sandwiches are so convenient and can be so versatile at the same time. Plus this year marks the 250th anniversary of the sandwich! Let’s celebrate! We usually eat whole wheat bread and while I do make grilled cheese using our regular bread, sometimes I like to change it up a bit and go small! 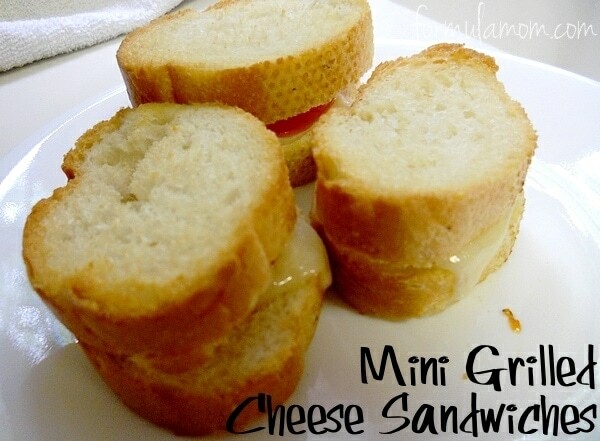 Little sandwiches can be a fun way to add a little twist to a meal! Oh and these are super easy. It is me after all and you know how I like easy in the kitchen! This recipe is super easy and once you’re done prepping, you can pop them in the oven and go hang out with the family for a few minutes. Yep, I said the oven! Instead of using a pan or sandwich maker, I bake my mini grilled cheese sandwiches in the oven to get a nice crunch! I love making these mini sandwiches with a french baguette because of the size but you could use a loaf of french bread as well. We’ve also used sourdough in the past as well. When it comes to making a delicious sandwich, the bread is the most important ingredient. You can change up the taste and it is the foundation of a great meal any time of day. 2. 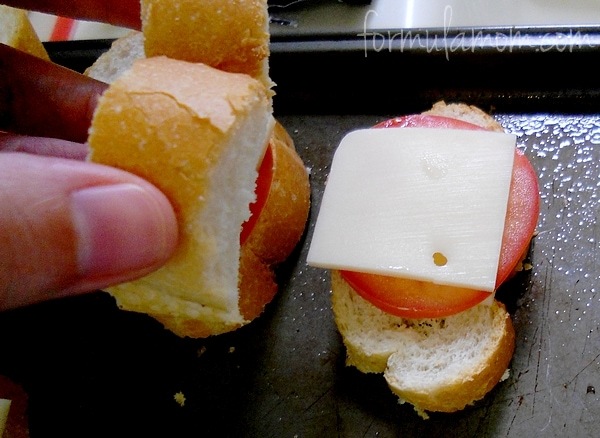 To prep these baked mini grilled cheese sandwiches, slice the baguette into an even number of slices. Each slice should be about 1/2″ in width. 3. 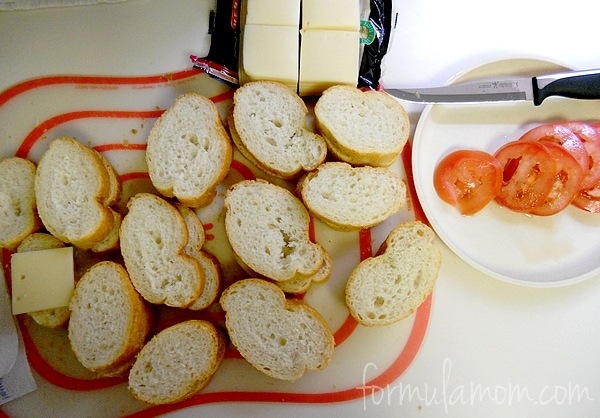 Slice the tomato into enough slices that you have at least once for each sandwich. 4. 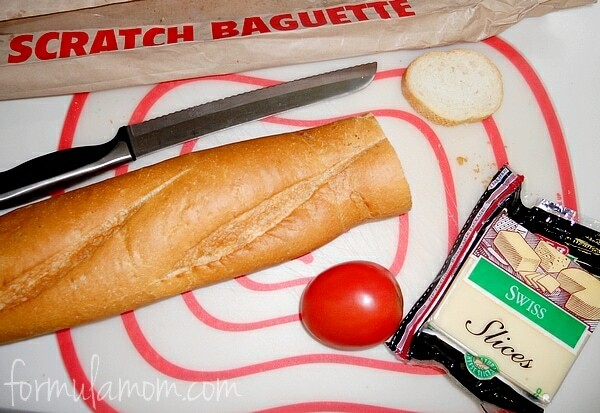 Cut the cheese into squares that will fit on our baguette slices. I usually end up using 2-3 cheese squares per sandwich. 5. Then build the sandwiches. I usually layer cheese, tomato, cheese to get a good melt during baking. 6. Pop the sandwiches in the oven for 5-7 minutes or until the cheese is melted. To prep these baked mini grilled cheese sandwiches, slice the baguette into an even number of slices. Each slice should be about 1/2" in width. Slice the tomato into enough slices that you have at least once for each sandwich. Cut the cheese into squares that will fit on our baguette slices. I usually end up using 2-3 cheese squares per sandwich. Then build the sandwiches. I usually layer cheese, tomato, cheese to get a good melt during baking. Pop the sandwiches in the oven for 5-7 minutes or until the cheese is melted. I have been eating sandwiches for most of my life. I’m pretty sure I’m not alone either. I love the ease but I also love that the complex carbohydrates in bread and grain-based foods help give my body energy to make it through my busy day! With a good whole grain bread, some cheese, and some meat, I can quickly put together a sandwich that helps me power through the afternoon at work. And I love going out to eat with Grambo on Saturdays and enjoy a Vegetarian Reuben at a local restaurant. It’s become one of our favorites! Combined with quality family time, it’s just perfect! In honor of National Bread Month Celebrity Chef Bryan Voltaggio has created some delicious sandwich recipes! They are easy and great-tasting! What more could you want? You can find all of the recipes at Go with the Grain. Tell me about your favorite sandwich! Formula Mom Disclosure: I wrote this review while participating in a blog tour for Mom Central Consulting on behalf of the Grain Foods Foundation. I received a promotional item to thank me for taking the time to participate. My kids love grilled cheese! This would be perfect for them, I think I’ll have to try this out sometime next week. Not to mention, I love tomato on my grilled cheese. But I can also see me doctoring it up with even more toppings, lol. Bacon, onion, turkey, spinach, basil, just to name a few possibilities. Thanks for the inspiration!! We are big grilled cheese fans here too! We love homemade chicken salad with cranberries and pecans or apples diced in it. We also love Grilled HAM and cheese or meatball sandwiches or Philly steak/chicken and cheese…the list is endless! We keep nice hearty whole grain breads on hand all the time but I am famous for making up dinner rolls to stuff pulled pork or roast beef into and put under the broiler with some cheese and veg for an open faced sandwich too! I thought I was the only one who liked tomatoes on grilled cheese!! Who knew bread had it’s own month! We are having Grilled Cheese sandwiches tonight, actually. One of my favorites, and my kids as well!